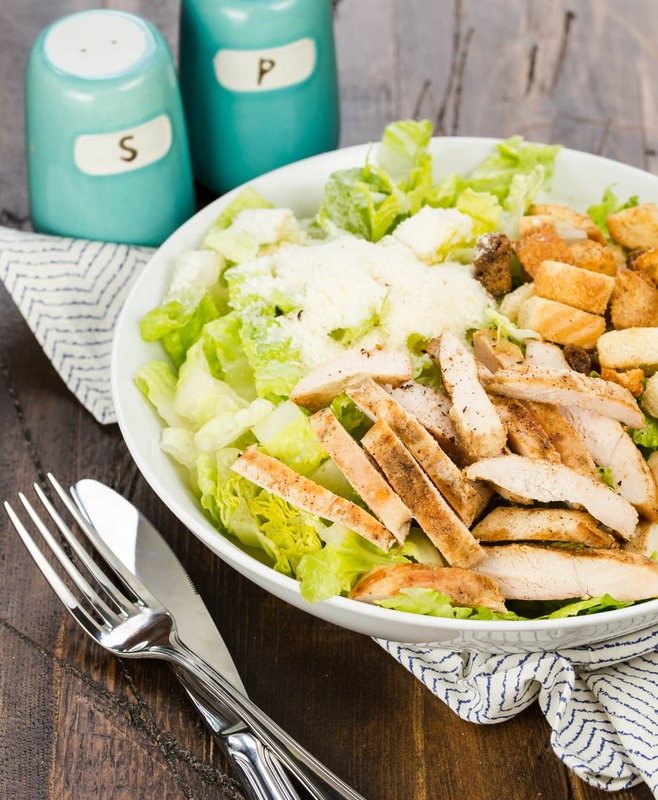 Filled with juicy chicken, parmesan, and crunchy croutons, this Grilled Chicken Caesar Salad with homemade dressing will become a regular in the meal rotation. There are Caesar salad likers and then there are Caesar salad lovers. On hectic summer nights, our love of salads runs especially deep. (This Chicken Strawberry Salad and Buffalo Chicken Salad are 2 other favorites that make regular appearances on our table!) Like a lot of busy families, the four of us rarely eat dinner together at a normal hour, and the last thing everybody wants is to wait for me to cook dinner when we finally get home from one of our many activities. But when this Grilled Chicken Caesar Salad is on the menu, dinner is a snap. I grill the chicken earlier in the day, as well as clean the lettuce and make the dressing. Simply toss a loaf of bread in the oven while you put the salad together and – presto – a light, protein-filled dinner is ready to be devoured by all. Tip: Don’t have anchovy paste on hand? Mince 3 anchovies and add to the dressing instead. Not an anchovy fan? Leave them out and add a dash of extra salt to taste. 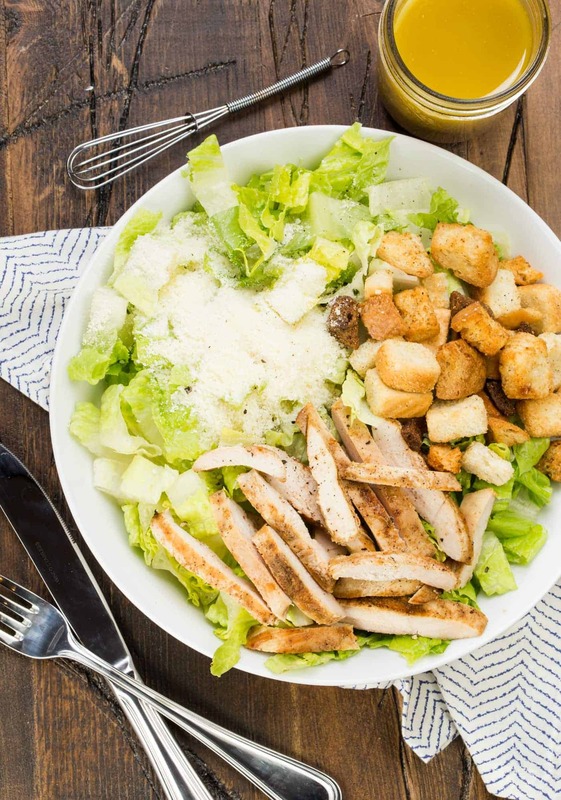 A light, flavorful Caesar salad with grilled chicken. Season chicken breasts with seasoning, salt and pepper. Grill 8-10 minutes or until juices run clear. Remove from grill and tent with foil. Slice into strips and set aside. Whisk together anchovy paste, garlic, lemon juice, red wine vinegar, mustard and Worcestershire sauce. Slowly add oil and whisk until thoroughly mixed. Stir in parmesan cheese. Place romaine hearts on plate and drizzle with dressing. Add chicken on top and garnish with croutons, anchovies and grated Parmesan cheese. Caesar Salad is a favorite of mine, too! Love your blog and love your beautiful food photography. My niece, Tiffany, and I have nominated your blog for the Liebster Blog Award. Check out the post on our blog. I’ll email you separately with a link. Keep up the good work! Thank you, Carole! We are so flattered and will check it out! Enjoy the Caesar Salad! What a nice compliment! Thanks, Lillian!